The tomb on the right is the Harpy tomb. The original friezes from this are in the British Museum, and replicas have been installed here. They are around the mortuary chamber at the top of the tomb. They are dated as around 470 BC. 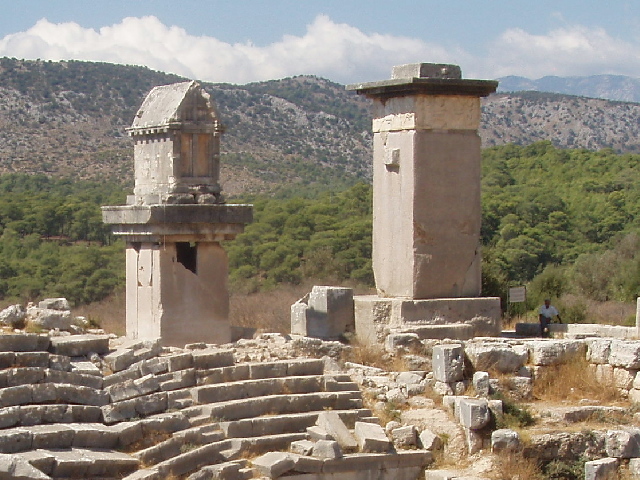 The other tomb, also Lycian, is a sacophagus on top of a short pillar. The tombs are by the theatre, which was rebuilt in Roman style in the 2nd Century AD after an earthquake.